The start of the race saw pole man Hamilton lead away whist fellow front row starter Vettel was passed into the first corner by Bottas. The Ferrari's of Vettel and Raikkonen struggled in the early laps as they started on the harder soft tyres this enabled Verstappen to pass both drivers and it wasn't long before he was also passed Bottas into second place. Hamilton managed to keep Verstappen at bay but further back Vettel ran wide enabling Raikkonen by into 4th place whilst Ricciardo was up to 6th from 11th on the grid after taking a 5 place engine related grid penalty. 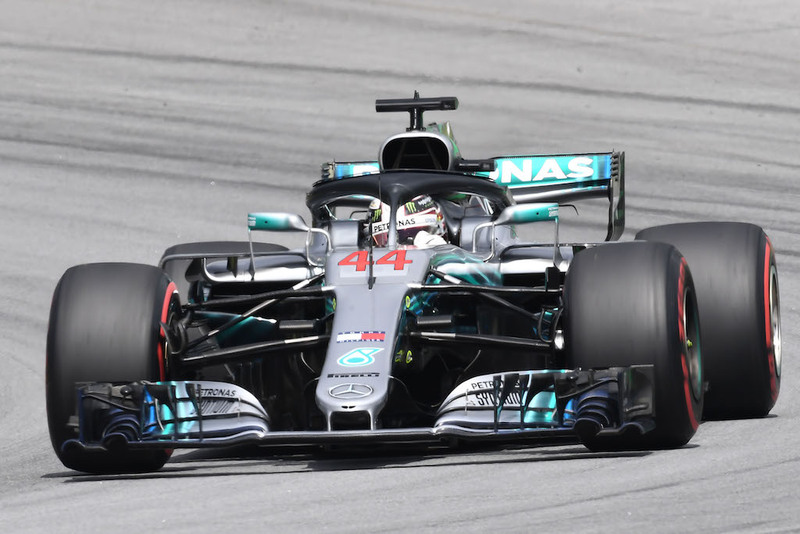 The Mercedes cars started to struggle with their tyres wearing and both Bottas and soon after Hamilton had to pit onto the hardest medium tyre, the Ferrari's of Vettel and then a few laps latter Raikkonen were able to pit much later on the medium tyres, Vettel pitting before Raikkonen allowed him back in front of his teammate. The Red Bull drivers Verstappen and Ricciardo stayed out even later than the Ferrari's which meant they could go to the end of the race on the quicker soft tyres when they pitted, Verstappen rejoined the race only a few seconds behind the leader Hamilton and on the fresher and softer tyres it wasn't long before he went by Hamilton for the lead of the race. Further back a team order was given for Raikkonen to pass his teammate Vettel who was struggling for pace, Bottas held up Raikkonen for several laps before he was passed likewise Ricciardo went by the struggling Vettel, with nothing left to lose soon after Vettel pitted for more tyres going onto the softest range of tyres, the super soft tyres. Bottas was then passed by Ricciardo, a decision then was taken to pit Bottas onto the soft tyres to safeguard his 5th position against Vettel, meanwhile up front Ocon had pitted for fresh tyres and rather than being held up by the leader Verstappen decided to pass and unlap himself, Verstappen decided to defend his position on the track and the two cars collided and spun which allowed Hamilton back into the lead, Ocon received a 10 second penalty for the collision. This left Verstappen 5 seconds behind Hamilton and even though his car was carrying damaged he started to close down the gap to the leader and towards the end of the race this had closed to under 2 seconds but Hamilton managed to hold on for the win, with Raikkonen in third from Ricciardo, Bottas and Vettel. In third place with 141 points and receiving the "Reliable Raikkonen Trophy"
In second place with 147 points and receiving the "Furious Verstappen Trophy"
In first place with 164 points and receiving the "Gifted Hamilton Trophy"
I'm assuming that Jenson easily winning with a strategic penalty is going to reignite the debate we just had! People seem to be ok with how it is. 117 points. Not my best prediction. I didn't think Haas would be strong, and that's where I lost a lot of points. I thought they would be strong but I simply don't trust the drivers and with no one else really picking them it seemed a bit risky, go for it for the title or play safe in a relative strong position hoping to just gain a few points? It's rare that the top 10 finish nearly in grid order, which, save for Eriksson, is what happened. I'd convinced myself it was going to be wet, and that Grosjean would be the first in the wall, hence hedging my bets by including Hulk. That didn't work out either. What no one really could have forseen pre-penalty time was just how strong Sauber were going to be. All of the top 6 actually finishing too tends to keep the scores fairly even, but the order this time was heavily messed about by Vettel being so low, I got pretty lucky on this front. Yeah I've just contacted someone today to see if he's happy to receive the secret entries of the top 10 players, like you say it can't be me otherwise being in 3rd place I would have an unfair advantage, I was going to ask one of the mods but they've both somehow managed to squeeze themselves into the top 10. Maybe someone would like to volunteer? I could do it if your other lead doesn't work out. I curate the Top Three Championship, so I'm used to this sort of thing - and I'm not realistically in this race at all. That's fine by me, he's still not replied, my guess is that he's not a frequent user of the board and it's better this is sorted sooner rather than later, I will pm you. After the last round you are a strong favourite now. Would I be correct in thinking that a 26-point advantage is the highest anyone has entered the final race with? Off the top of my head I would say no, from experience 26 points is reasonably close. Edit: Just checked in 2016 Covalent had a 56 point lead over somebody called Exediron. Entry submitted to Exediron for Abu Dhabi. I tried to forget about that! Also, a reminder: I only have predictions from two of the top ten as of yet. Don't leave it too late and get a penalty! Picks submitted to Exediron. Good luck, all! Reminder that the deadline to avoid a penalty is 8 hours and 30 minutes from now. Picks submitted, without outside influence just go with my gut feeling this time which would have paid off for me in Brazil, cheers Exediron. Just waiting for Bentrovato and Mod Titanium, then. Here we go, season finale!